Give my ears a rest. between the late-nite sessions in my garage and my morning listening, I clocked many hours in headphones. I'll be happy to give that a rest. Give my arms a rest. Between the day-job in front of a computer and the drumming, bassing (needs strong hands and fingers! ), and guitar shredding (usually 3 tracks per song), I'm starting to feel it in my wrists and forearms. Surf. The rest of the body needs some exercise too. Now if only the weather would cooperate. Give my liver a rest. I wouldn't necessarily say that I've been drinking too much wine for the past month. But getting out of a nightly routine that involves a glass of whine can only help. Right? Family-time: who are these people I love with anyway? Time to get to know them again. No, I don't mean my family on http://www.quakelive.com. House-time: I was literally shoveling caca out of my garage last weekend. Time to get the place in order. Cook. I enjoy working in the kitchen. As we get closer to summer, it's time to get this rolling again. Plan. 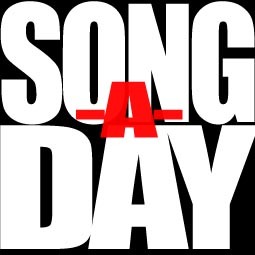 What did we learn from Song-A-Day that would make Song-A-Week more successful? How are we even defining success at this point? Song-A-Day is as fun for me as a listener as a player. If people are interested in continuing this, I think we can turn it into something really cool. Sleep. Need a short break from the late nights. Get outta Dodge. March is a perfect time for a quick weekend getaway: Tahoe, Healdsburg, Mendo, Santa Barbara. Here we go. We did it. Congrats to everyone who put their songs onto the site. Thanks for all your hard work; I had a great time listening to all of your songs. This URL will take you to all my songs. This player has everything that was uploaded. Steal the embed code if you want this on your site. We're almost to 13000 song streams at this point and if the traffic followed last year's pattern, people will still be listening for a few more days. Starting to think about Song-A-Week for the rest of the year. Email me if you want in on this. Seth and Derek (among others) asked for some details on how I recorded a few songs this year. I've been pretty happy with the guitar sounds overall. The big improvement from last year seems to be the mic. I'll tell you everything about what I do. Maybe it'll help you find that killer something. Guitar: Fender Lead II (1980) with a really kooky humbucker pickup (I think it's a Bill Lawrence, but possibly a dimebucker?) in the bridge position. Someone really took a lot of time modding this guitar before I bought it. This pickup is special though, haven't found many that sound like it. Amp: ZVex Nano Amp. A .5 (!) watt tube head which should get most of the credit for the sound. It's really an amazing piece of gear that produces controlled overdriven mayhem at a reasonable volume. Zack, my wife, children, and neighbors thank you. A->D: Aardvark Q10 a really handy piece of gear. I'm using its built-in preamps. Aardvark went out of business a few years back unfortunately. This thing is still going strong for me. 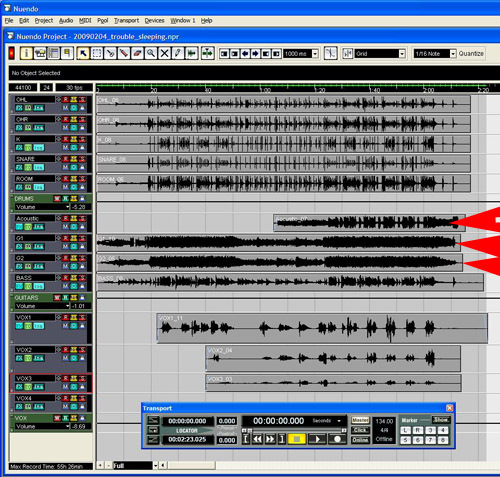 Multitracking: I have an old version of Nuendo 1.53 (the latest is 4) as my main multi-tracking application. Several effects: Waves RCL is the main compressor I'll use. I set up some really simple, standard reverb as a sendd effect too. 1 Dirty Secret Ingredient: That Evil Multiband thing that comes with Nuendo. This may be the thing that takes a decent sound from the guitar/amp/speaker and makes it really sing on a recording (perverting it and possibly ruining it at the same time). 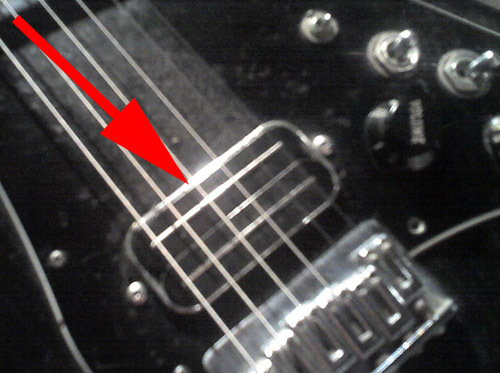 Set the guitar to use the humbucker pickup only. Volume and tone wide open (11). Believe it or not, someone fitted my guitar with an XLR output. I don't use it, just the regular 1/4" jack. 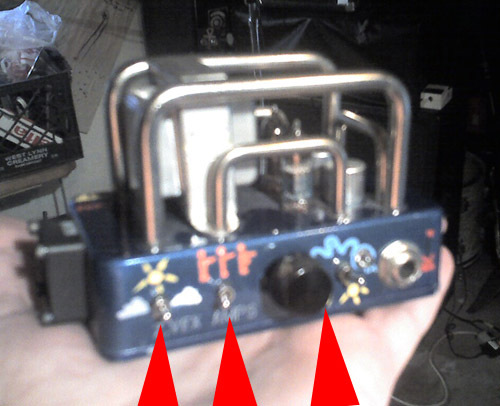 Set the ZVEX amp to brighness: middle, thickness: normal. Volume knob is about 3/4s+. There's only 1 knob on this amp I get it into the distortion space, but not all the way up. The amp is relatively quiet, the sound is a little mid-rangey, but it sounds good in the room. Mic the guitars pretty close. About 4-6 inches away from the cabinet's grill. I'm using a large cap condenser for this. I've been leaving the mic in the omni position lately. The sound is a little more open. That proximity effect wasn't doing anything to help the sound IMO. At this volume, I trim the Aardvark's preamp to "6.5" (not sure if this is a db level or something specific to the Q10) so there's a strong signal and still a fair amount of headroom. I'll usually double the main part of the song, then add one more color track, often with a different distortion and pickup setting. 2 main (heavy) guitars panned hard right/left. Usually with no EQ. 1 guitar up the middle, usually cleaner (distortion-wise). Might use a little EQ to fill a gap in the wall of sound. Posssibly with a bit more of the send-verb too. Group all the guitars. Use light compression with the RCL on the group. Might shelf the bass a little (I'm monitoring with NS-10s and I've found that if I can hear the bass at all there will likely be a problem on other systems.). I'll usually add a touch of room verb as a send effect. The overall mix is important too of course. The drum sounds are reasonably loud, but offer some space. 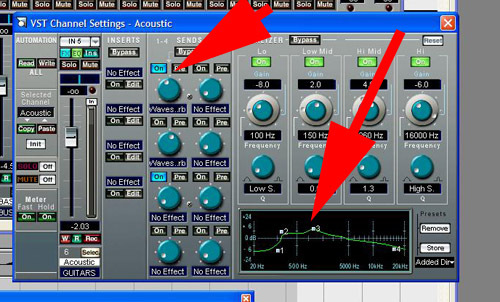 The bass has a few EQ notches (where? I'll check) to carve out space. I haven't been too happy about the vocal sounds on the full-band songs this year, so no help in this dept. 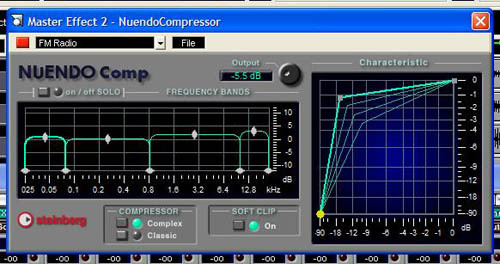 Here's the Dirty Little Secret: Bus compression is the evil Multiband thing. Yeah, there it is. It's out. What are the settings here? Hard to tell what all these mean. I'm basically choosing the "FM" preset and trying to dial it back just a bit. Actually, now that I look closely to a randomly picked mix, it looks like I'm just using the default 'FM Radio' setting for 'Trouble Sleeping'. Plus a few more that will likely come before we cross the finish line. We're trucking along with Song-A-Day. This is the point in the month where the daily contributors cross the 'album-length' line. For me, an album doesn't really need more than 10-14-ish songs. So if the well wasn't so damn dry I'd say that the rest of the month is gravy. For me, it's time to turn to other instruments, other family members, more wine, plagarism... you get the idea. I have a few comments in no particular order. I'll tune into http://www.xanga.com/sethrocker a bit more. Somehow this fell out of my RSS reader. Totally understand the schedule crunch. Toss in whatever half-baked ideas you want to share. This follows the 'every idea is a good idea' principle. badaba works! It's a mostly-baked idea. More of these please. adding the drum + background vox for Derek's song was a great idea. I think we've all heard another part that would fit in with the stuff we've heard from each other. You are so prolific, it's always fun to hear your stuff. I like the acoustic versions you're putting up there. Both versions of 'Thank You' are nice. The acoustic version is a treat. Did you get a microphone? "Not Much" I like much. "Acou" I like a bunch too. I like instrumentals. Would be fun to add vox or more to one of your tracks (like Seth added to Dereks). There are a few other instrumentalists this year. Can you out-Tom Tom? or out-Ryan Ryan? http://bringbackcardwalker.blogspot.com/ has fallen out of my RSS reader too. I'll tune in there. I'm glad to hear that you've roped the family into songs. I disagree with your thesis presented in 'Monkeys and Clowns'. Songs that mention Monkeys can be turned cool by the mere mention of robots. "Jury Selection" really works for me. Quietly angry. Totally pissed in fact. Dangerous. That's how you come across. I find "Second Life" pretty damn cool. "Me and the Pope" is a triumph. I'll be watching Meet the Press for the story. All your recordings sound very natural and high-fi. They work well on every speaker I've used to torture my family. I haven't read http://midgaardsormen.blogspot.com/ much lately (also fell out fo my RSS reader), but I'll add it. Short and sweet works for me. "twothreeohnine" is a highlight for me for some reason. I love the mood. I think it's also because of the sound... I can hear the room. I like the confessional-style of the recent lyrics. I need more please. Get back to work. I'm so psyched that you're doing this. There's a moment in the beginning of Twilight that reminds me of a song by Rodan, but you take it in a totally different direction. There are a few other instrumentalists this year. Can you out-Tom Tom? or out-Bruce Bruce? Great to have your music up here this year. Vocal and guitar chops are coming through loud and clear. Is Bigsby a person or a vibrato? (or a cat?) I like this one. Is "Annalime" using an open tuning? Neat. 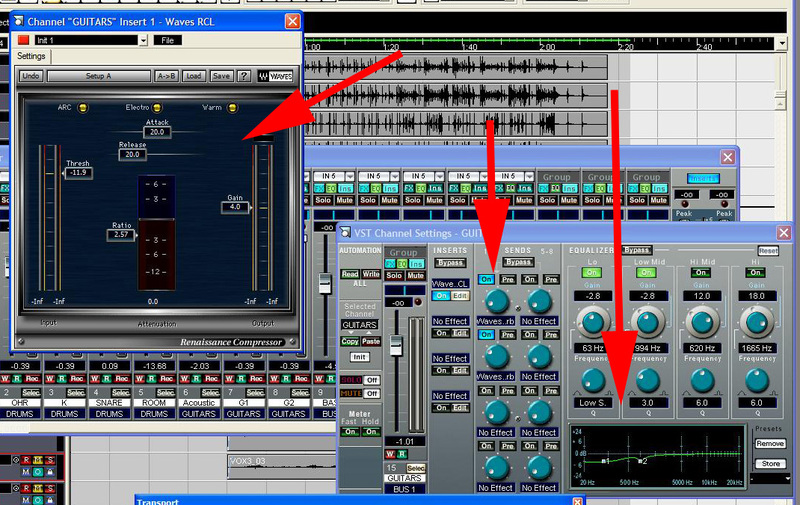 Are you using an amp modeler or a microphone. I like the dirty guitar sounds. There are a few other instrumentalists this year. Can you out-Bruce Bruce? or out-Ryan Ryan? If you know anyone else interested in playing along for the rest of the month, invite them over. http://feeds.feedburner.com/songaday is a daily wrapup of songs. This feed has 1 item each day that mentions the songs/notes that have been uploaded. http://feeds.feedburner.com/songadaymedia is a MRSS feed. Each song that is uploaded will get a mention in this feed. http://feeds2.feedburner.com/songadayitunes is suitable for tossing into itunes or another podcast reader that will slurp up itunes-specific feeds. http://js-kit.com/rss/songaday.netscrap.com/songs/ is a feed of all the comments on the site. There are songs. A bunch of them, in fact! And good ones! I'm loving it. You are all very brave and generous for being part of this. Also: It's not too late to get going. If you know anyone else interested, email me and I'll get them set up. I'll get the 'edit song' thing together soon. Just holler if you made a typo or mistake and I'll fixy. The media feed is handy to use if you have an mp3 player that takes an rss feed. Has anyone tried the itunes podcast feed/link yet? If you want to show off your own songs, you can link to a list of your own tunes: http://songaday.netscrap.com/songs/?scrap_owner=greacen just click your name in the (poorly placed) list on the right part of the screen. Don't hesitate to backdate if you want! Or if you prefer, upload a song tonight and date it for next week. There are no rules around this. The "notes/lyrics" go into the daily summary feed. Yes, the list of "Tags" goes into the RSS feed. In the 'All About You' section... if you set an image url for yourself, it'll soon start to appear in the itunes and podcast feeds. In your Bio, use html if you want to spiff-up your 411. Thanks for reading. I need to go mix.